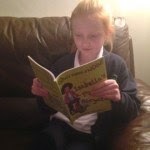 Introducing the next generation of #bookbloggers on @BestChickLit #KidLitChat for my Children’s Fiction Blog Tour. Today I am pleased to share with you the content from BestChickLit.com . They recently featured my ‘Once Upon a NOW’ series of children’s books and introduced the world to super-reviewers Ellie and Eden (aged 11 and 9). 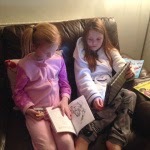 Both girls read the books and between them created 5 wonderful reviews for ‘Alf The Workshop Dog’, ‘Isabella’s Pink Bicycle’ and ‘Kool Kid Kruncha and The High Trapeze’. (particularly as they liked the stories 😉 ). Kindle version of ‘Kool Kid Kruncha and the High Trapeze’ is FREE on Amazon Worldwide today & tomorrow (27/28 Jan 2015) http://www.smarturl.it/Kruncha. This entry was posted in alf the workshop dog, BestChickLit, book review, children's books, Free Kindle books, Kool Kid Kruncha and the high trapeze, Once Upon a NOW, review by emmacalin. Bookmark the permalink.